OmiCronFX : A good read for the summer hols | “Reminiscences of a Stock Operator” by Edwin Lefẻvre. 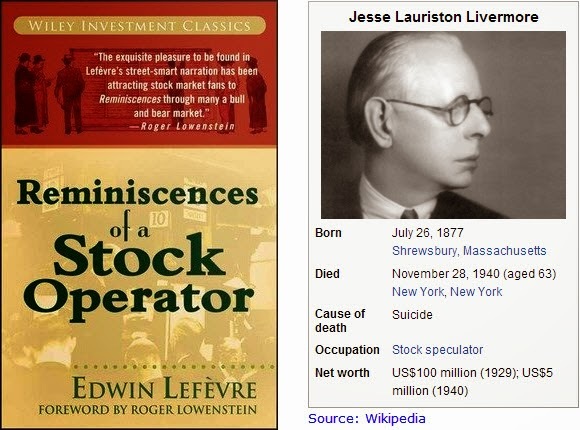 A good read for the summer hols | “Reminiscences of a Stock Operator” by Edwin Lefẻvre. One of the most widely read books on trading is “Reminiscences of a Stock Operator” by Edwin Lefẻvre. While written as an autobiographical work, i.e. in the first person singular, it is actually a collection of anecdotes from the stock speculator, Jesse Livermore. He collaborated with Lefebre, who was himself a journalist, in order to plant articles in newspapers from time to time to “assist” with his trading activities, and to stay in the information loop in 1930s New York. While there are many parallels with trading today in the descriptions of what happened, and in the attitudes of traders and the public in the ‘thirties, they did not, of course, have access to charts, the Internet and other trading aids that we have today. Neither was the Foreign Exchange market open to trading in the way it is now. The gold standard, among other things, made sure of that. But much has stayed the same. For example, instead of Contracts For Difference (CFDs), Binary Options and other methods that exist in the present for facilitating “trading” where the service provider takes no risk and the buyer is saved the bother of having to hold actual stocks, in Livermore’s day they had “Bucket Shops”, where bets could be placed on the behavior of share prices. The owners would offset one person’s bet against another’s, with a margin for themselves. Manipulation in these establishments was not unknown - in fact one could be forgiven for thinking that it constituted the rule, to a great extent. Livermore apparently developed a methodology of monitoring the ticker tape, then the only medium for broadcasting stock prices to the investing public, and establishing patterns, as Technical Analysts attempt to do today. He has much to say about greed, and fear, and the prodigious appetite for tips on likely stock movements. He noticed, as is the case today, that big, round numbers constituted significant levels in the rise or fall of prices. But he was, as Lefẻvre puts it, a plunger. He went from nothing to fabulous wealth and then all the way back again, to penury, and he did this on more than one occasion. It would appear that we have learned a thing or two in the meantime about the management of risk. Employing the required principles is, or course, the challenge. But do read the book, perhaps when you are relaxing on the beach this summer. It helps to show, in a readable way, from where the trading that we indulge in today has come. If you have read it already, this might be a good opportunity for a revisit.